Add a new record to the data table by following the steps below. 1.Click Add ... at the bottom of the data table. Notice that a new blank record is displayed at the bottom of the data table. 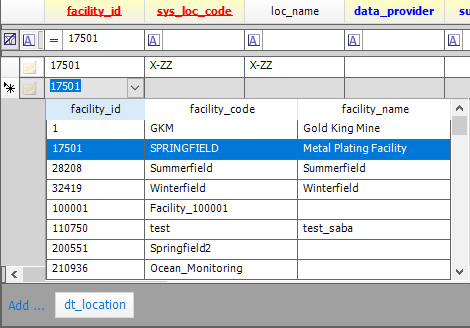 2.Click the arrow in the FACILITY_ID column and choose the name of your facility. In this example, it is the Springfield facility. Note: The text on the Add... button is dynamic and reflects the current table.